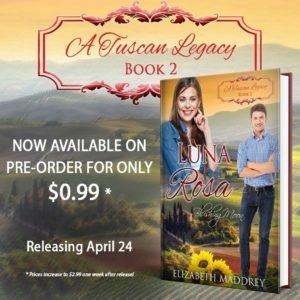 I’m super excited that my contribution to the Tuscan Legacy series, Luna Rosa, is set to release on Tuesday! Book one in the series, That’s Amore by Marion Ueckermann released this week and I hope you’ve all been enjoying that delightful introduction to this multi-author undertaking! There will be 9 books in all, released one a week, for the next 9 weeks. Since we’re so close to the release date, and there’s a little sneak peek in the back of That’s Amore, I thought I’d go ahead and give you an excerpt to whet your appetite just a little more. Nick closed the lid of the grand piano in the choir room of his church and moved around to the keyboard. Sunday afternoons were always hard. His brother Piero was off on another globe-trotting photo shoot, probably beating the women away with a stick. Or not beating them away, which was much more Piero’s style. A woman—or two—in every port, and never a backward glance when it was time to move on. He sighed and let his fingers roam the keys. For being twins, he and Piero couldn’t be more different. His brother had gotten all the dark, Italian good looks. Nick looked as American as his father. Not that there was anything wrong with that, but all-American boy next door was never going to win against mysterious Italian. He didn’t even have a corner on the musical talent. Both his brothers played. Mom had insisted on it. Nick was the only one stupid enough to try and make a living from it. Irritation flashed in her eyes and she opened her mouth. “We were just getting to that.” Nick let her tug her fingers once before letting them slip from his grasp. Nick fought off a laugh at Bob’s poor choice of wording. Would she ever give them her first name? Or were they really meant to call her Ms.? “I know. But let’s give it a whirl.” His heart hammered in his chest. What was he doing? Even Bob was trying to stop him from making a colossal mistake. But this woman—she needed to see that there were people who could play the piano every bit as well as she could. Just because she chose to make a living in front of the keys instead of behind them didn’t mean he hadn’t had that same opportunity. Once. His gut twisted. Best not to go down that trail. “As it’s usually the more difficult, I’ll take primo.” She slid onto the bench and positioned her hands over the upper keys. She lifted her chin, her gaze scanning the notes for a bare second before she nodded and counted off a swift measure. It was better than he’d imagined in his head. He’d played both parts before. He’d even recorded one and then played the second along with it to get the full effect, but that didn’t compare to the beauty of the experience when both parts were live. For all Ms. Chalfant was a diva, she knew how to play. She seemed to lose herself in the music, the dynamics swelling and receding as if they were simply part of her, not something she had to remember to add. Soon—much too soon—they reached the end of the piece, breaking off at the same time as though they’d practiced together many times. “Because I like to eat.” Nick shrugged and started to stand, but her hand caught his arm. Her hand dropped from his arm as her mouth opened. “Just tell me when you want us to play, Bob, and I’ll be there. I’ve got to run.” Nick grabbed his bag and offered Diva-girl a nod. Nothing he’d said was a lie, but it wasn’t the complete truth, either. He’d had a shot at a performance career, and he’d flubbed it so badly the people who’d been there were probably still laughing about it eight years later. I hope you’ll all join us in Tuscany during April, May, and June! Hi Elizabeth, so excited for this to release! This book sounds great- I am eager to read it and see how things turn out! Thanks, Wemble! Just 4 more days! This does sound like a marvellous series. I’ve enjoyed all of the entries I’ve been able to read so far! I really think the whole series is going to be fantastic. Hi Elizabeth! I am so enjoying A Tuscan Legacy and your excerpt has me hooked. What a fun read the next 8 weeks. Best wishes to all authors for the creativity and for reader as they devour this delightful series. Enjoy the weekend. Oh, it sounds so good!!! Oh I love series, just hate when the story line ends. Series ends are always bittersweet. It sounds like a fun read! this story sounds divinely good! I loved that excerpt! I connected to Nick right away! And the music. Yay! I’m so glad. I’ll admit to loving Nick a lot. He was fun to write. Beta reader here – you all are going to enjoy this one! This is going to be a fantastic series!! I just read the first one in the series and I’m so looking forward to ALL of the books! I know it will be a FANTASTIC series! I’m part Italian and this series has gotten me thinking about my heritage! So Fun! Thanks for all you ladies have done by writing this series! I can’t wait to read yours next! I love it, that the story is centered around music. Yay! We’re all super excited about the series! Ha. That’s how I’d be! This whole series looks awesome! I can’t wait! Great excerpt, Elizabeth! Looking forward to your upcoming release! Thank you Elizabeth for bringing us an except for Luna Rosa. I already purchased it and can’t wait to read it. I have preordered all of them. Yay! Thanks for preordering! Hope you enjoy them. Luna Rosa was a great read! I’m currently busy reading book 7 and like you, can’t wait for 8 and 9 (no pressure, Autumn LOL). I’m anxious for Autumn’s, too! I liked his attitude about tuning. It reminded me a little of Harry Connick Jr. in Hope Floats when Sandra Bullock says, “You go around Smithville painting houses when you can do this.” His reply is one of my favorite movie lines EVER. Oh! I love that movie — and that line! <3 I haven't seen it in ages, but I need to change that now!